With these words, C.W. plopped himself onto the couch and began eating an apple. 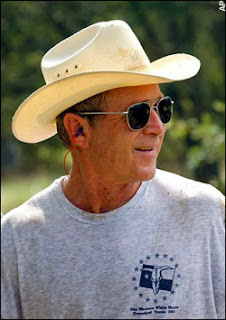 He tilted his Stetson hat to the back of his head and crossed one leg over the other. His boots were of dark leather and as polished as his oversized belt buckle. “Sarcasm won’t get you nowhere,” he said. “It did indeed.” I decided to let him continue. "nucular option" then. Heh. Heh. - C.W. “Please continue.” He was beginning to make a point. “There you go again,” he said.